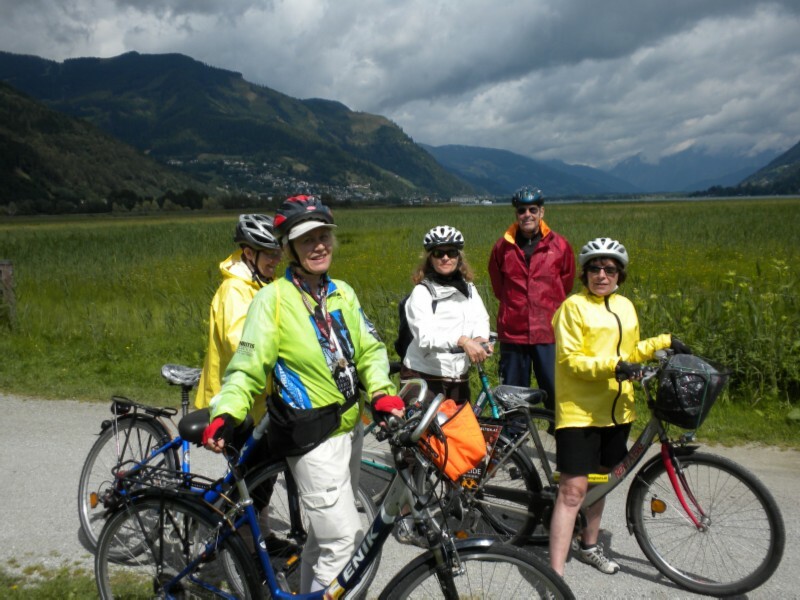 Aug 9 Tuesday  some light rain: We retraced our steps part way back to Salzburg on a REX to Zell am See. 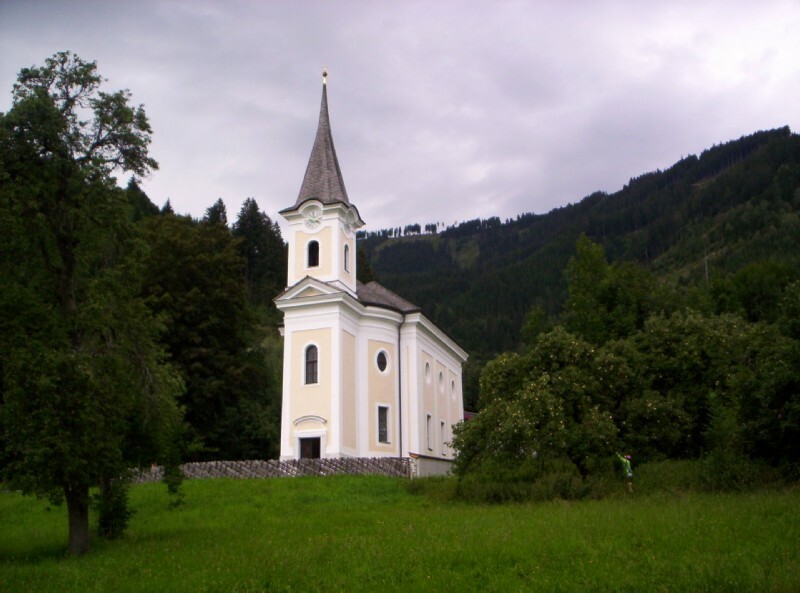 We easily found the conveniently located Landhaus Christa about ½ mile north of the lake in the Oberreit ortsteil of Maishofen. 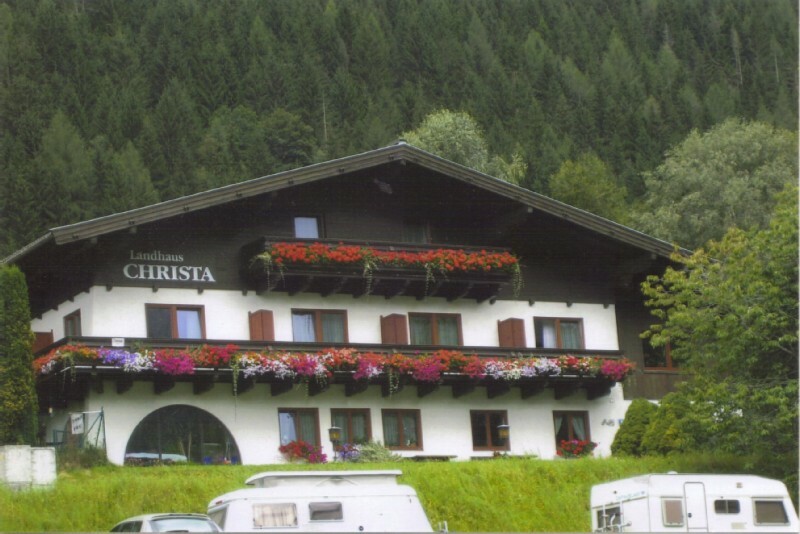 I had just about given up hope of finding lodging in our price range during high season in Zell am See or any of the nearby towns along the Tauern Radweg, when I found Landhaus Christa. It was an older but very nice pension with bath tub and balcony in our room and an extensive breakfast. View of Zeller See from the Landhaus Christa balcony. Marcia and I checked out the Maishofen area and selected a restaurant/cafe in the center that featured Italian for a change. It was at this point that I realized Maishofen was a much better choice than other surrounding towns. 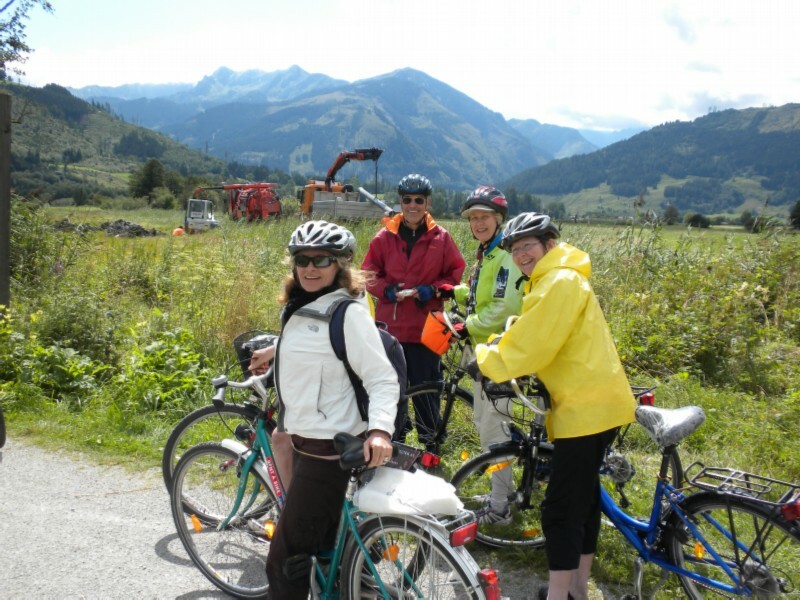 It was located in a broad valley with a very pleasant network of bike routes. We caught the first few numbers of a very interesting "big band" concert at the music pavilion in Maishofen. They used traditional rotary valve brass instruments but swapped out for American instruments for a few numbers. 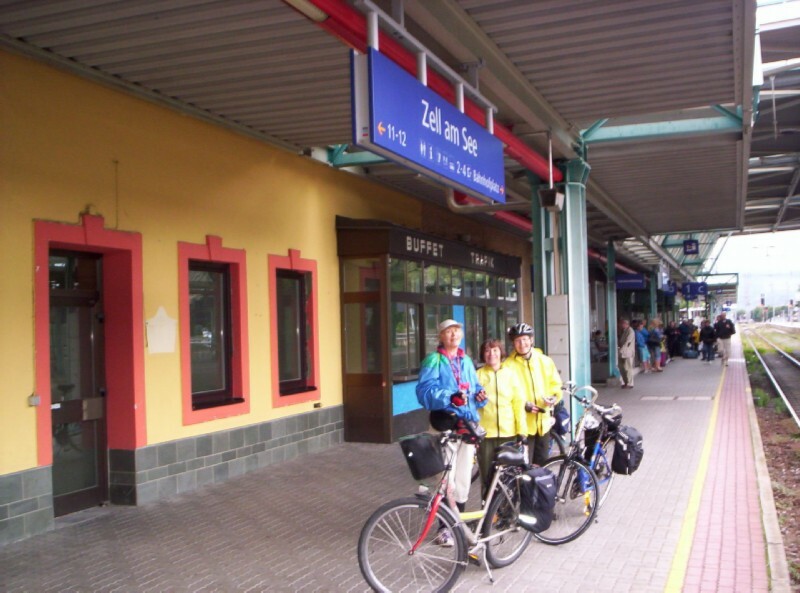 Aug 10 Wednesday - cloudy early, then nice: We met Stafford and Monica at the train station - they had stayed behind in Buch - and proceeded to bike around the lake. A rest stop on the bike path south of Zeller See looking south. Looking north towards the lake. The route took the road on the east side of the lake; but it wasn't a problem. After a slight uphill approaching Thunersdorf, we rested at a park. We then continued around to the north side of the lake where we turned north on nice country lanes and bike paths. We had lunch on a bench at the intersection of 2 country lanes. Schloss Prielau just north of the lake. A typical country lane in Maishofen. A more rustic path along side the edge of the mountain. We returned via the center of Maishofen to Landhaus Christa for a final round of 6 handed Euchre. We had supper at a restaurant featuring Mexican in Zell am See before saying goodbye to Stafford & Monica at train station. The mussels were not appreciated. Aug 11 Thursday  sunny and mild. 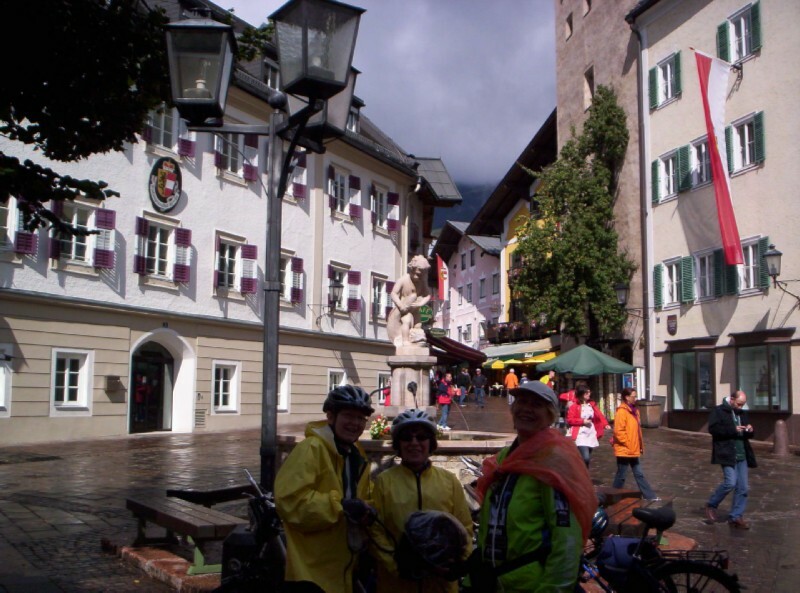 We escorted Janelle and Marcia to the train station for their ride back to Salzburg and on to Stuttgart for their flight home. 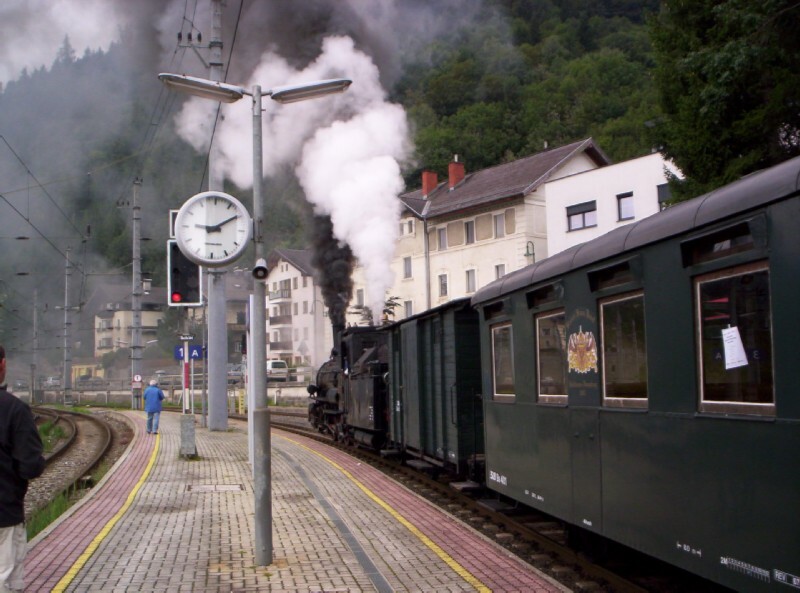 At the station there was a lot of action on the narrow gauge tracks of the Pinzgauer Lokalbahn which runs up the Salzach valley to Krimml. 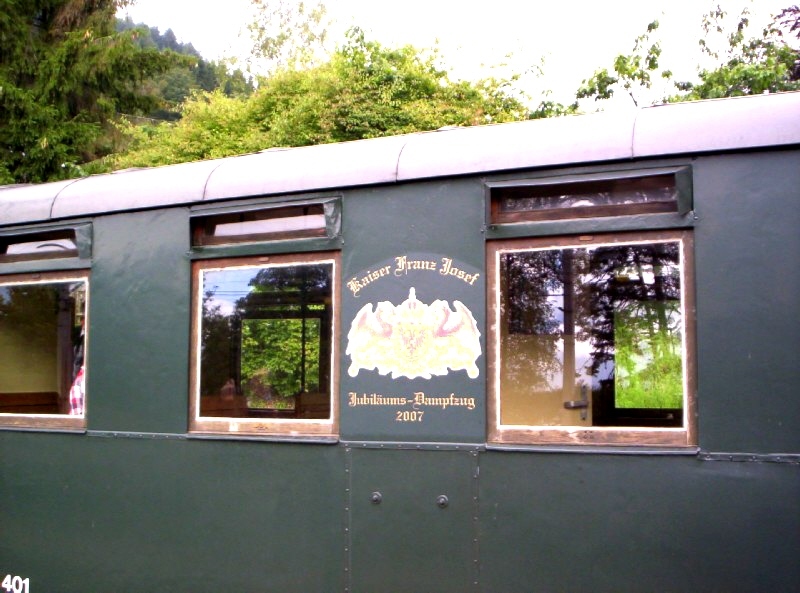 Narrow gauge Nostalgiebahn - special train with vintage cars - being pulled by a diesel engine. The bike car just doesn't seem to fit in with the other vintage cars. Nostalgiebahn pulled by a steam engine. A replica of Emperor Franz Josef's car? or the real thing? 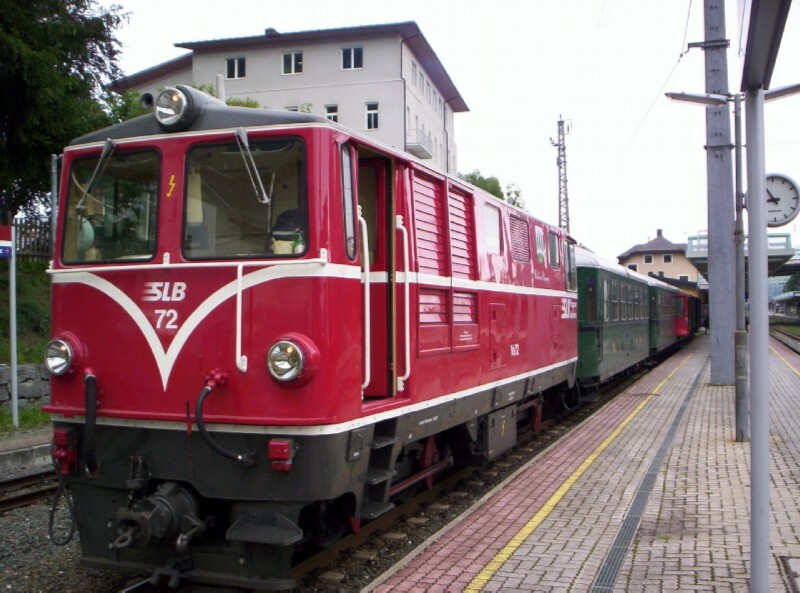 A modern triebwagen (self propelled diesel car) used during off peak times. They run as DMU's (diesel multiple unit) during peak times. 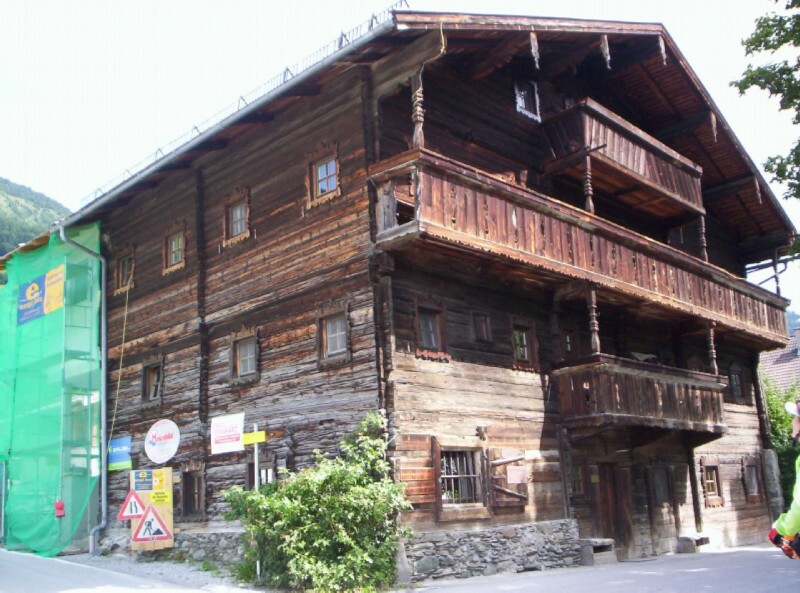 We headed to Kaprun, a ski resort town, about 5 miles south of Zell am See. 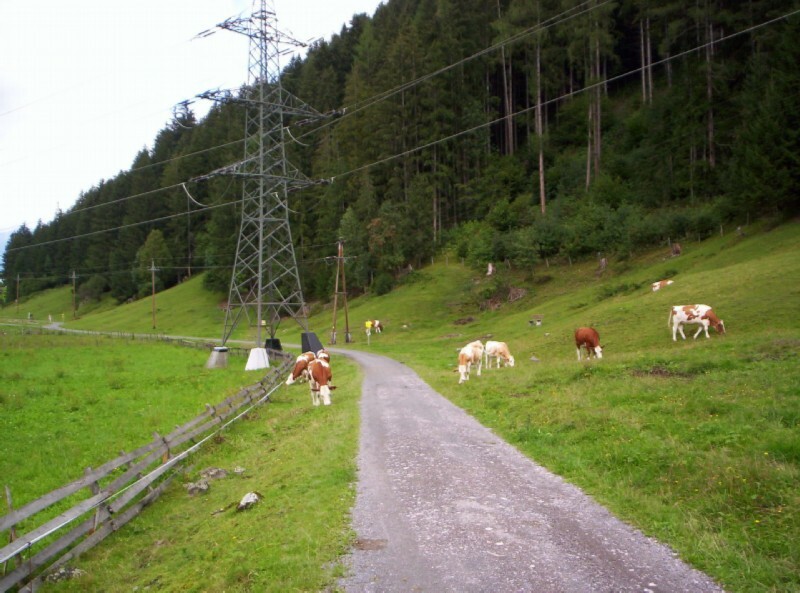 Bike path along the Lokalbahn track heading toward Kaprun. 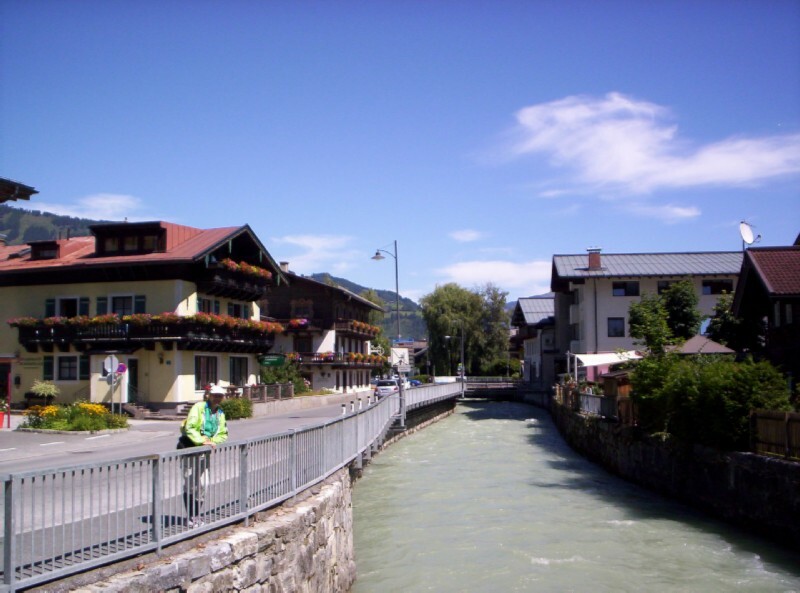 Kaprunerache (creek) in the center of Kaprun. 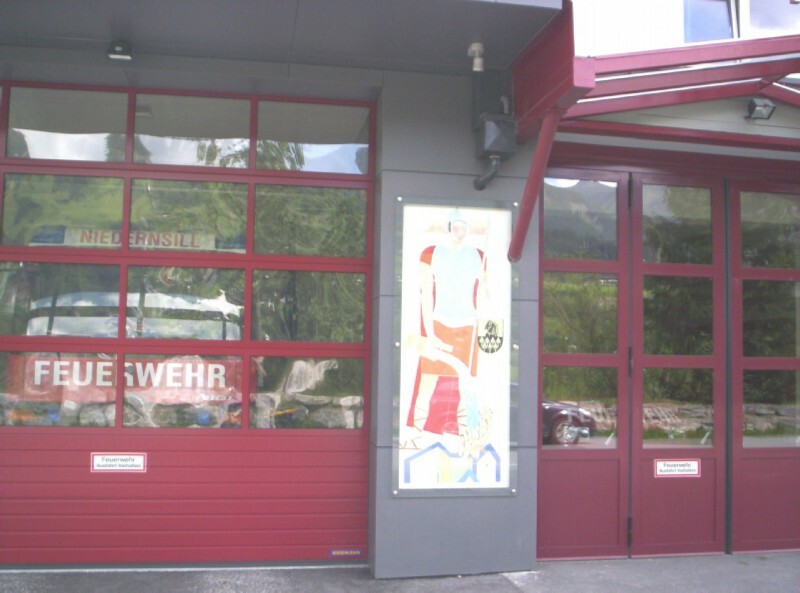 St. Florian doing his thing on the wall of the Kaprun fire station. 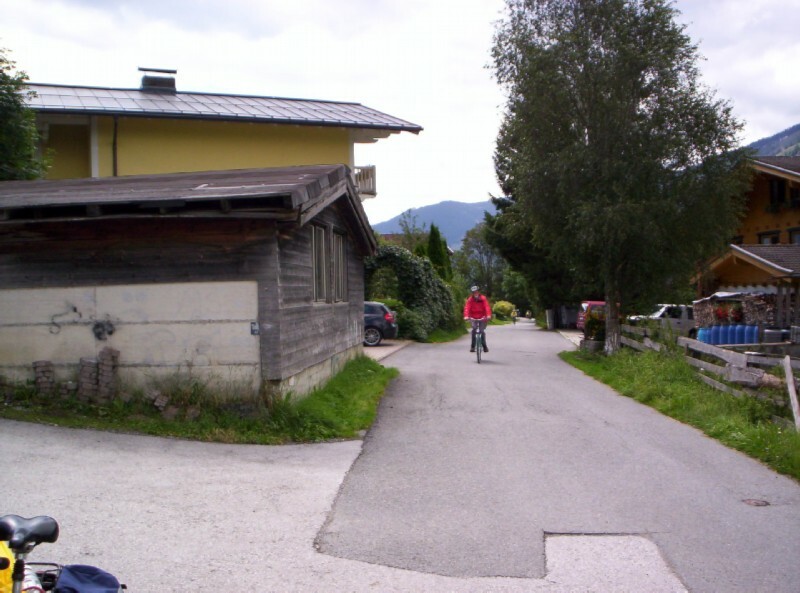 After having lunch on a bench at the tourist office, we headed east along the Tauern Radweg to Bruck an der Großglocknerstraße about 4 miles away. While in Kaprun we tried unsuccessfully to locate a classic gasthof where we had eaten outdoors 9 years ago and then attended a big band concert in the square next door. Where I thought the gasthof had been was a new, nondescript hotel; and the square was filled with building construction. 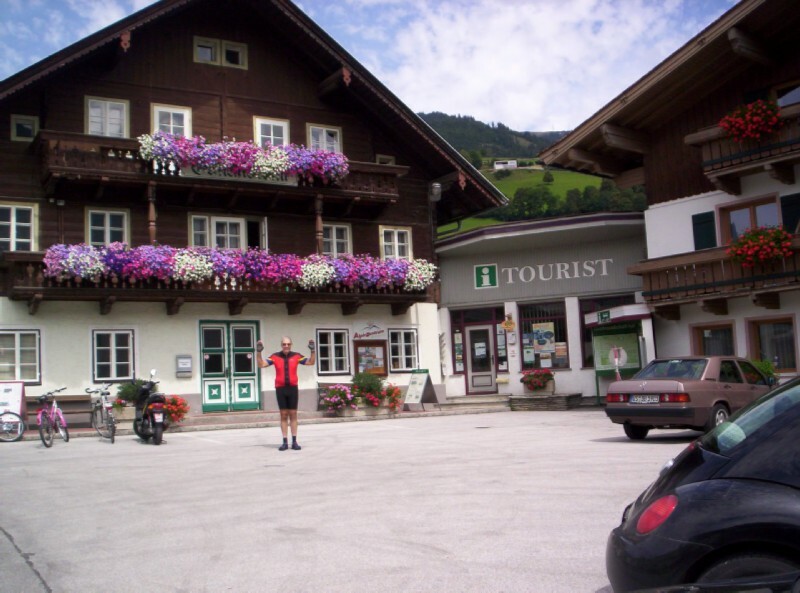 Someone at the tourist office confirmed that the hotel had replaced the gasthof. Schloss Kaprun viewed from the Tauern Radweg. 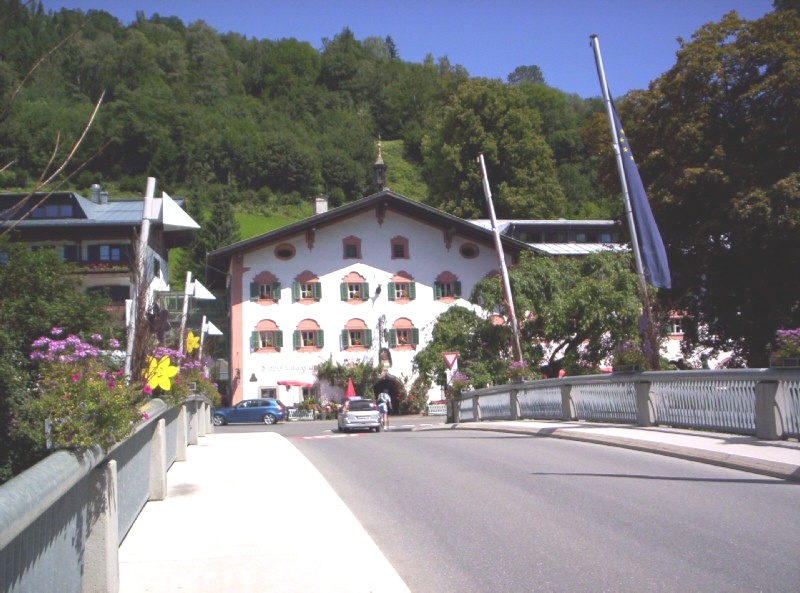 Bridge across the Salzach in Bruck an der Großglocknerstraße. 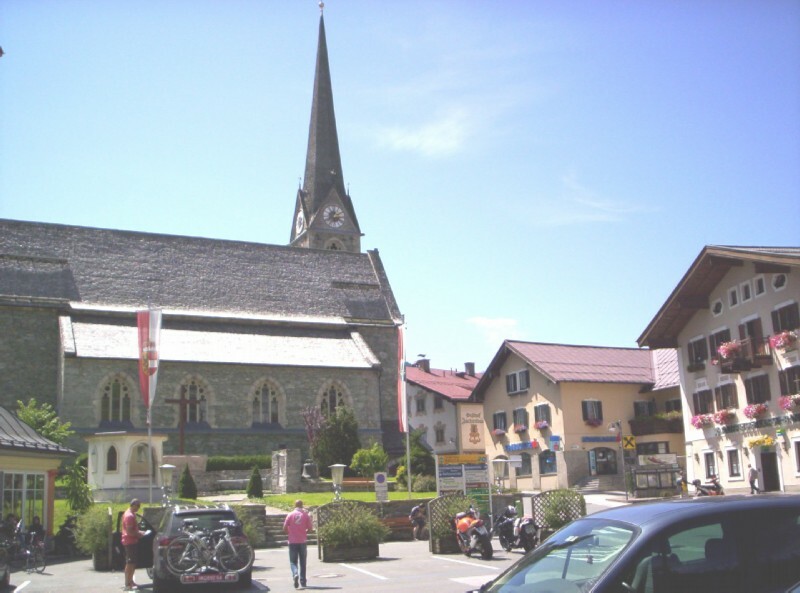 The town's name advertises its proximity to the Großglocknerstraße, a tourist road that crosses the Großglockner mountain, the highest in Austria. The center of Bruck an der Großglocknerstraße. 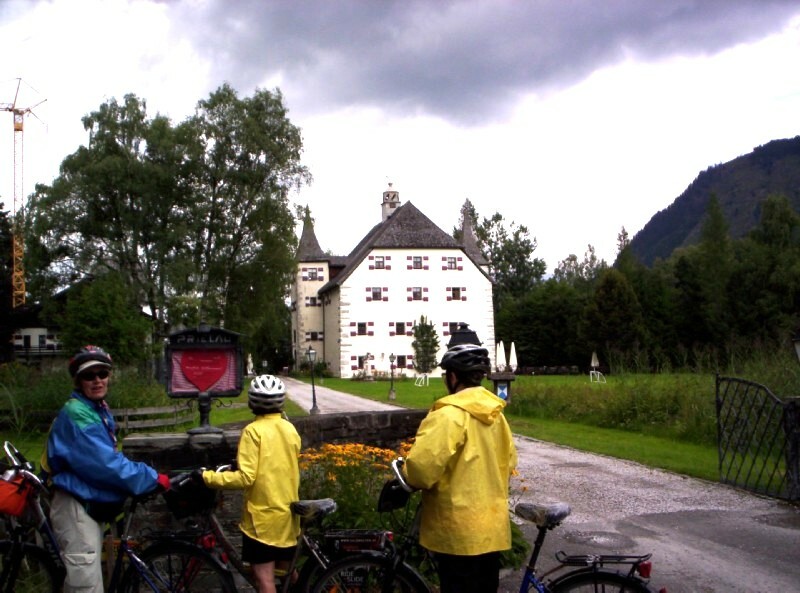 Another view of Schloss Fischhorn, this time from the Tauern Radweg in Bruck. 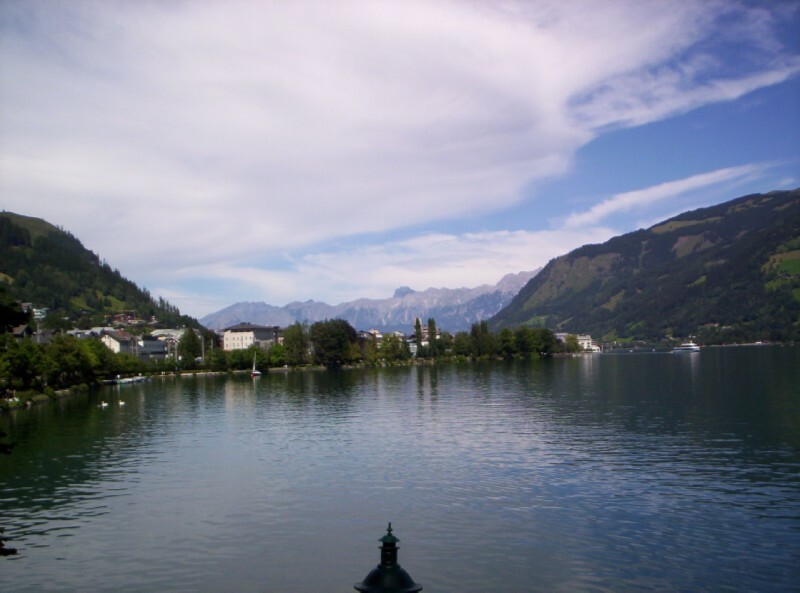 From Bruck we headed the 4 miles back to Zell am See northwest across flat ground south of the lake, completing a triangle, and then north along the lake to our lodging. 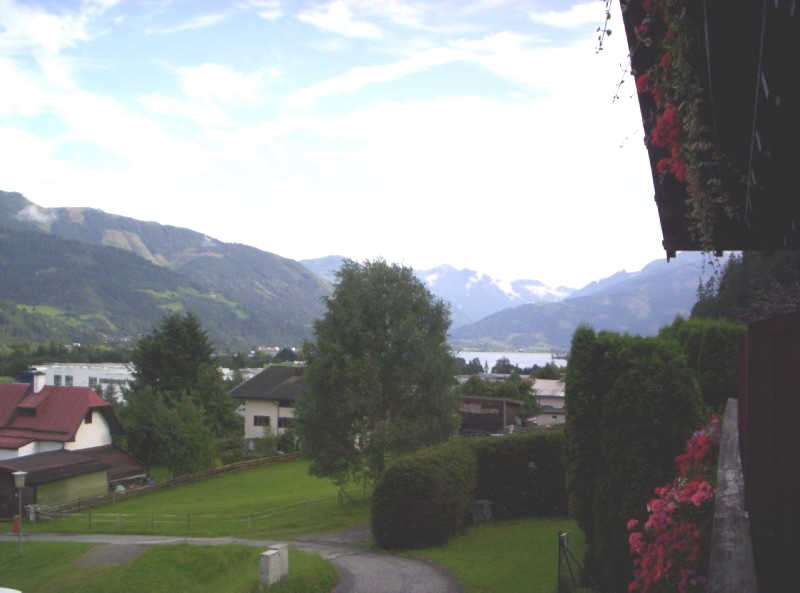 The center of Zell am See viewed from the south shore. The center sits on a peninsula that juts out into the lake, hiding the northern half of the lake. After resting up we headed back the cafe in Maishofen for supper. But since it was ruhetag, we wound up eating at a nearby gasthof and had a good fish fillet. 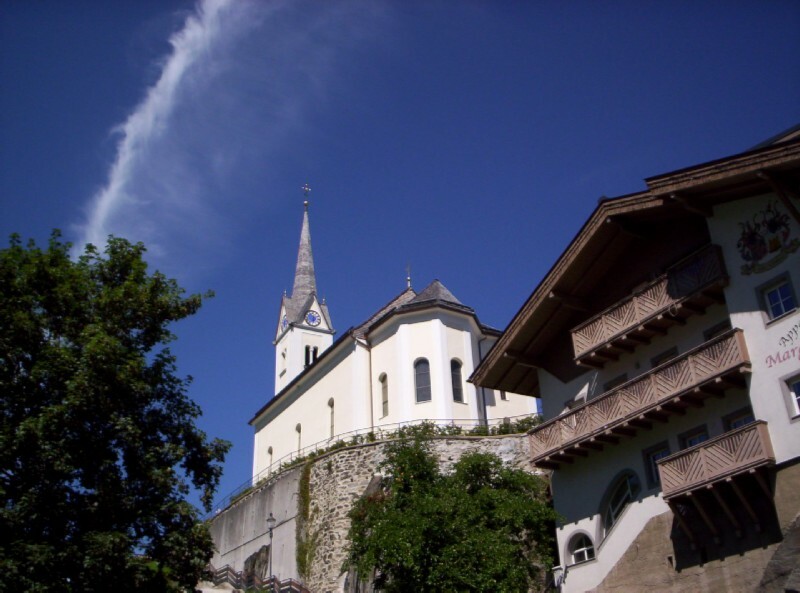 We then head back to Zell am See via Schloss Prielau for a blassmusik concert at music pavilion on the water front. It was very good; but not as impressive as the one in Buch. Excerpts from the concert - Can you spot the schnapps ladies? With each number the video gets darker. By the time the concert was over, we needed our bike lights as well as street lights along the path to get home. 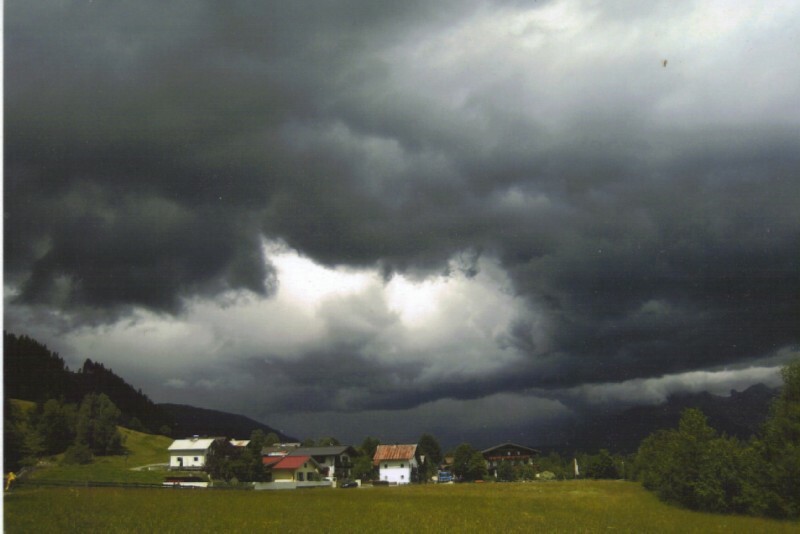 Aug 12 Friday - sunny with thunderstorm in the late afternoon: we took the Pinzgauer Lokalbahn to Mittersill and biked about 22 miles back. 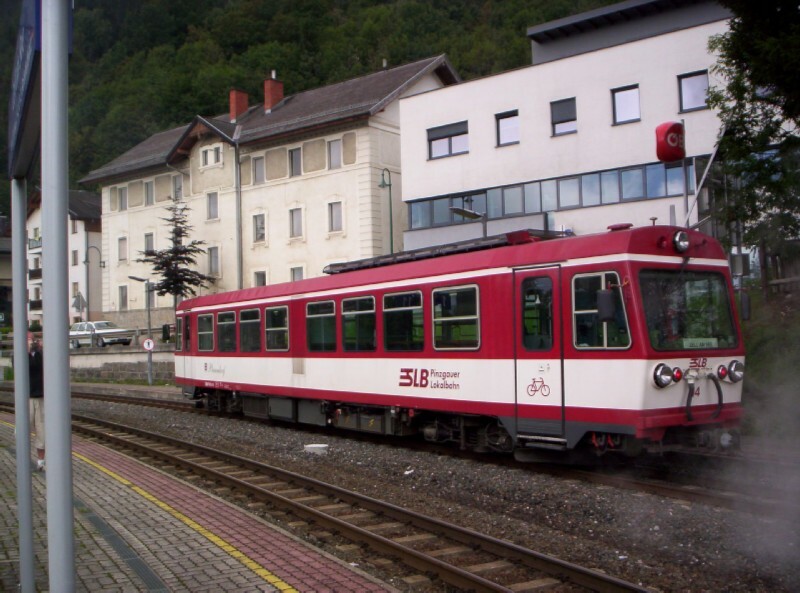 While at the Zell am See train station, we bought tickets for the next day to Radstadt. I was disappointed that the 9:15AM direct IC had all bike space booked. 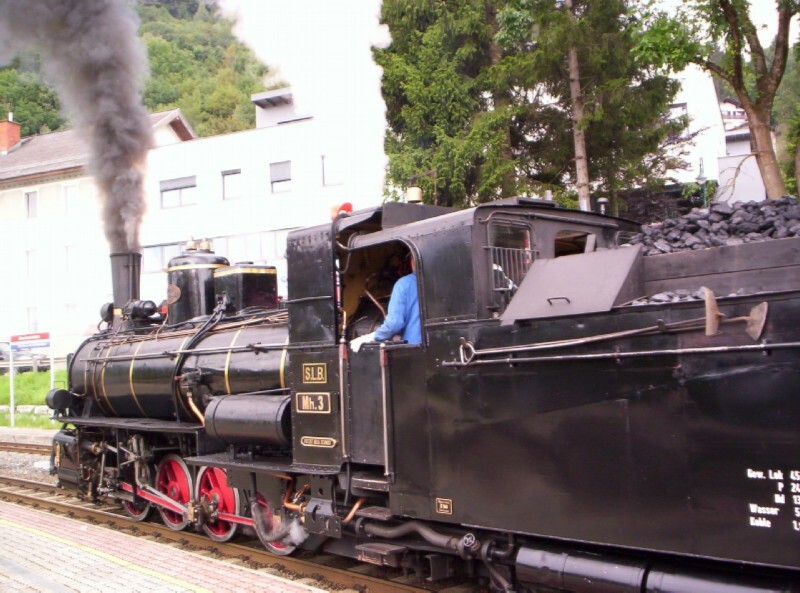 Thus we had to settle for an REX to Bischofshofen, changing to an IC to Radstadt. Even though the IC segment was very short, we had to pay the IC bike price of 10E, vs. 5E for the REX. 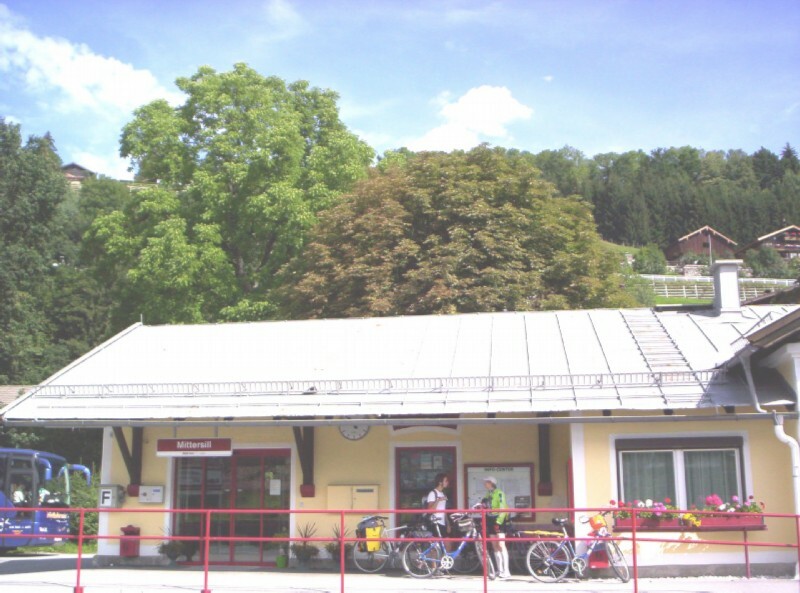 Although there were IC's every 2 hours between Bishchofshofen and Radstadt, local trains had been cut back to rush hour only. Salzach river east of Mittersill. This shows how rivers and creeks are channelized. 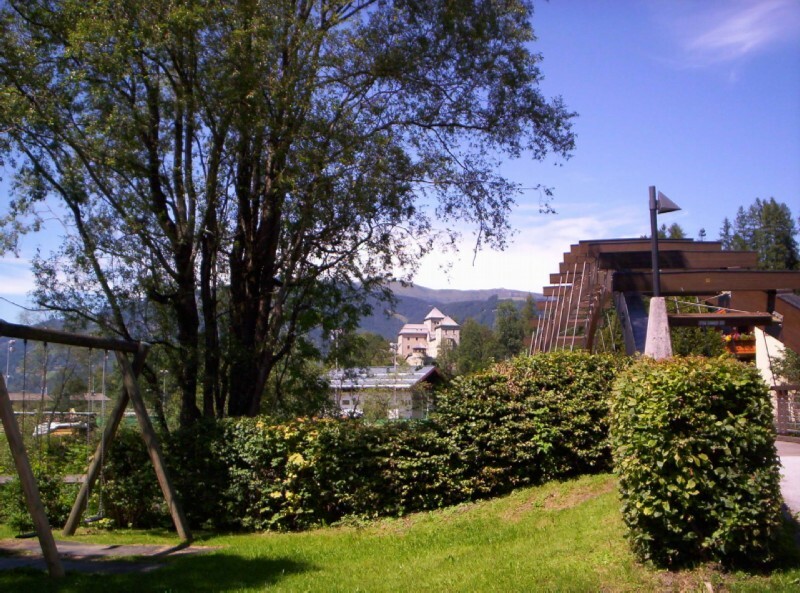 A prototype for modern alpine residential architecture in Stuhlfelden. 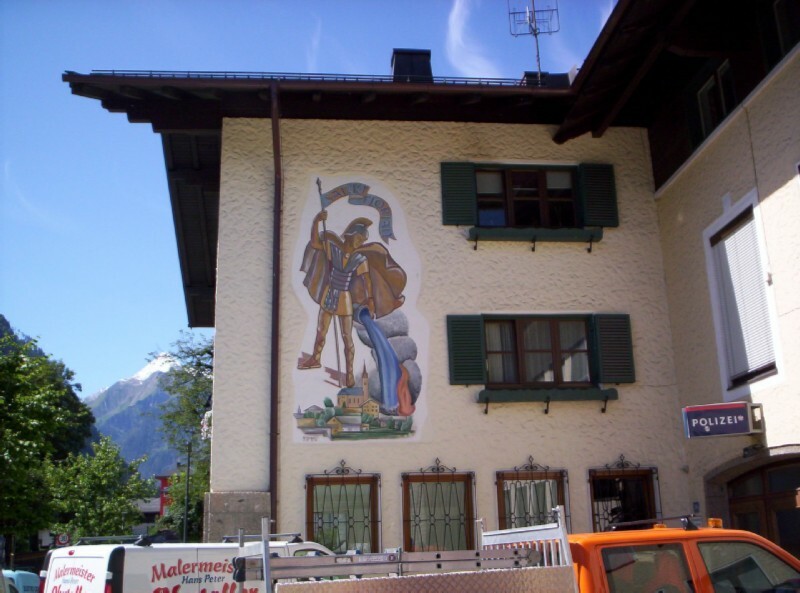 In the small town of Uttendorf, I went looking for the WC in the Gemeindeamt (town hall). When I went to leave, the door was locked. There was no sign outside; but signs on the few office doors inside indicated that it closed at 12 noon - it was about 12:20. I banged on the door and about 20 minutes later someone finally heard me and called an official who let me out. No sooner were we ready to leave town than I realized I had left my rain coat in the WC. Not only did it come in handy with all the rain, but it had sentimental and souvenir value as well. We went back and someone just happed to appear and opened door for us. Talk about clean living! The town hall where I got locked in. The tourist office next door was only an indirect help since it didn't reopen until 5:00PM. But someone from England who was checking it out called someone from the town. 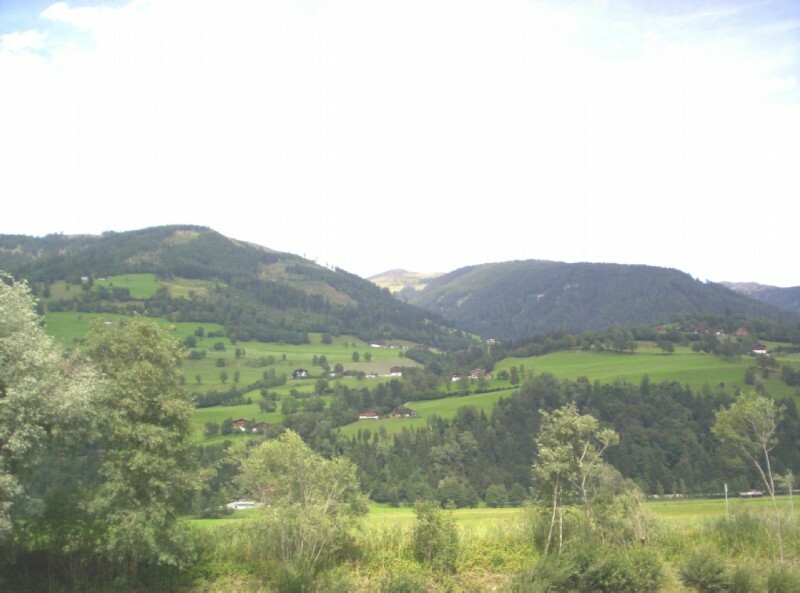 View across the Salzach valley between Uttendorf and Niedernsill. St. Florian again - this time at the Niedernsill fire station. 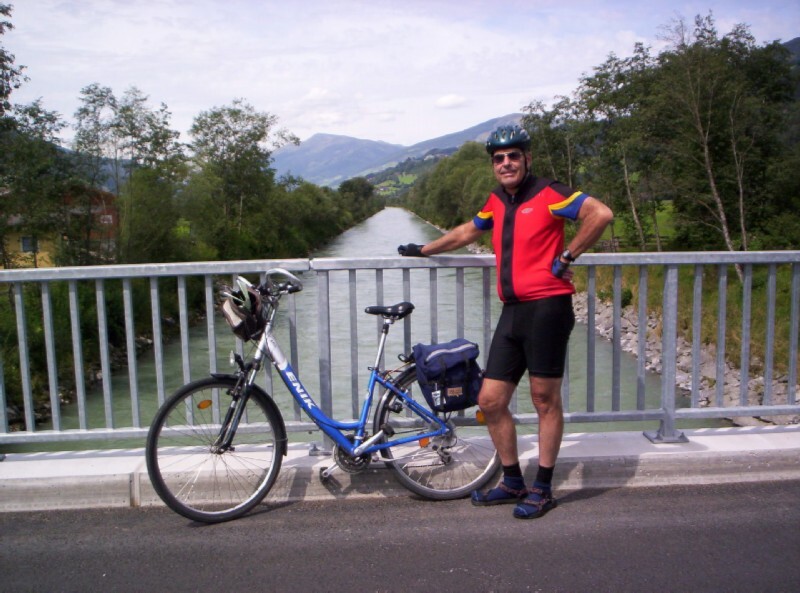 For the last few miles back to Zell am See we had the choice of the flat, slightly longer route via Kaprun or the more direct route via Aufhausen. Since we had been to Kaprun the day before, we selected the latter. 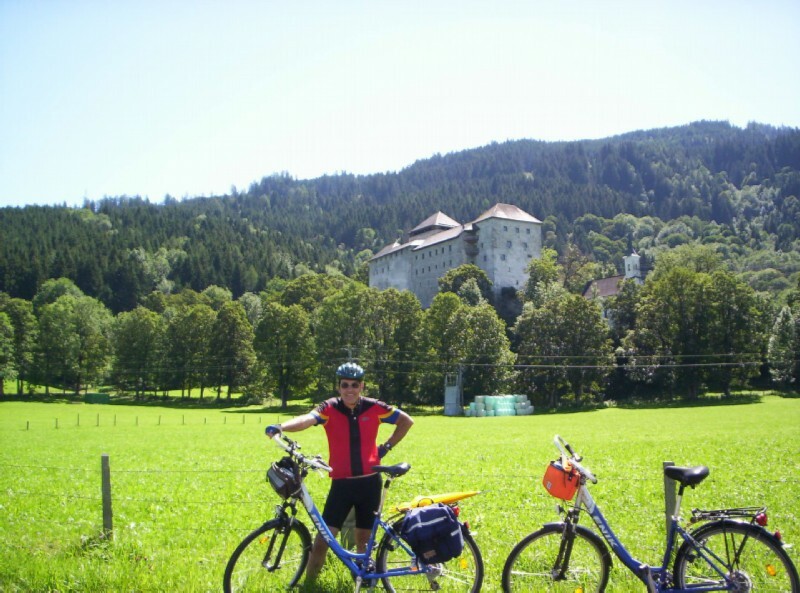 After a short, but very steep climb we reached the small village of Aufhausen. 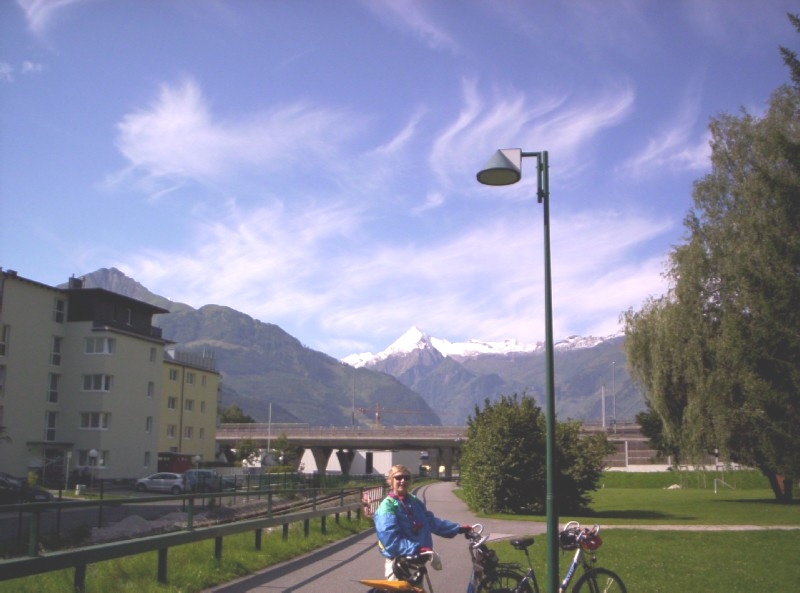 A nice downhill, then through an apartment complex's garage and a stairway under the highway brought us to the edge of Zell am See. Just as a short, heavy downpour hit us, we found a pancho for Jeanine at store in an Austrian version of a strip mall. After resting up, we went back to the gasthof in Maishofen for more fish.